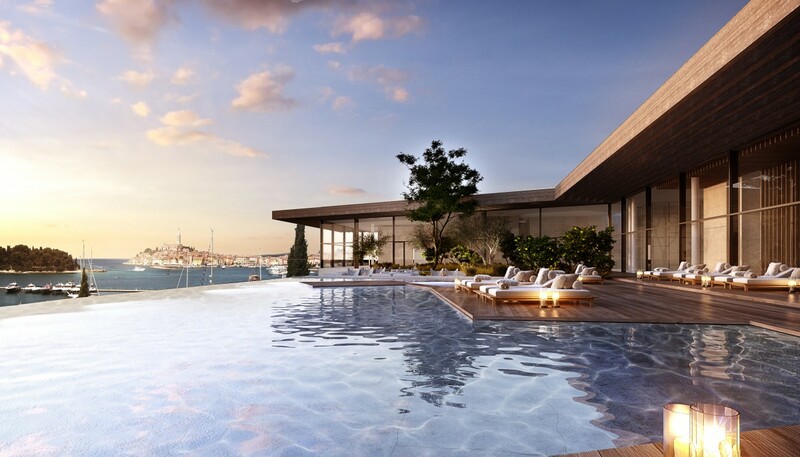 The Grand Park Hotel Rovinj was opened on April 1, whereby the Adris grupa completed the Monte Mulini area building project, one of the most luxurious tourist areas on the Adriatic. It is in close proximity to the Old Town of Rovinj and includes the hotels Monte Mulini, Lone and the recently renovated Hotel Eden. In the immediate vicinity are the promenade and Mulini Beach. 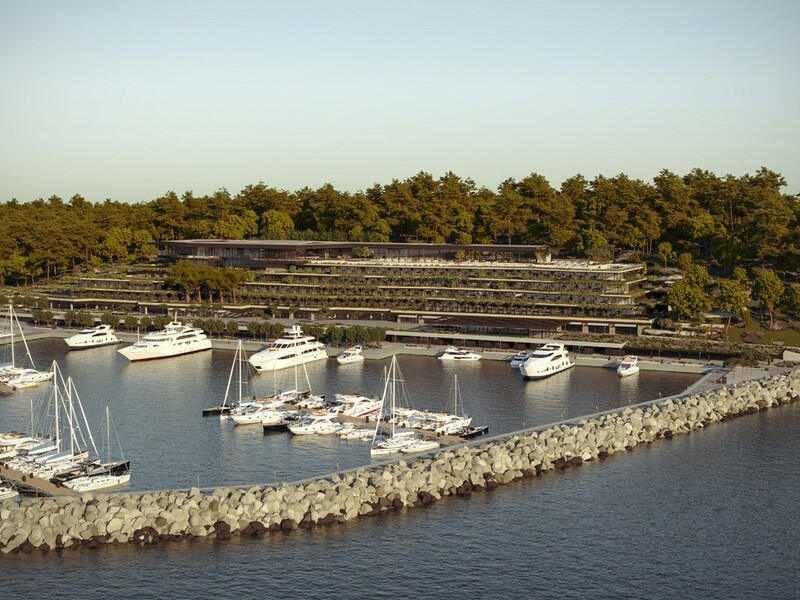 The 5-star Grand Park Hotel Rovinj is part of the Maistra Collection brand that includes upscale category hotels. The best local and international architects and designers worked on this project. 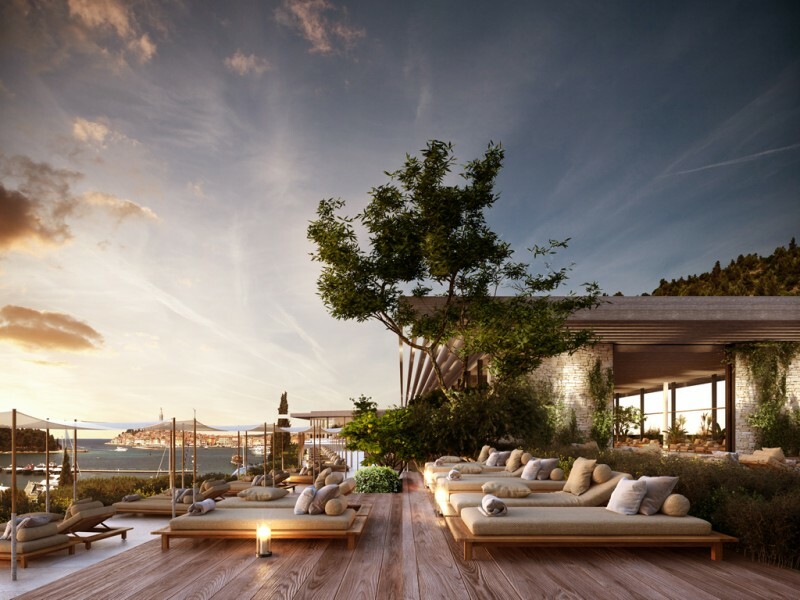 This is yet another collaboration between Adris and the Croatian architecture studio 3LHD, which was also behind the building of the hotels Lone and Adriatic and Mulini Beach. The unique location and the specific configuration of the terrain inspired the cascading type of construction and the creation of green rooftops over an area of ten thousand square metres, making the hotel visually very attractive and almost blended in with the surrounding greenery. The interior design is the work of Pierro Lissoni’s Milan studio – Lissoni Architecture, one of the most prominent and most famous designers in the world. Lissoni's work is known for its minimalism, with special attention paid to detail and choice of materials. Primarily natural materials such as various types of stone and wood were used in the Mediterranean-inspired design. Dark blues are prevalent in the hallways, with lighter colours in the rooms, namely grey, beige, and earth tones. The hotel’s interior design is mostly derived from Lissoni’s own impression of the hotel’s surroundings. The choice of artwork for rooms and communal spaces is another key aspect of the design. Each of the featured artists spent time in Rovinj, incorporating their experience of the town and the destination into the artwork that will embellish the hotel. Guests are also encouraged to experience the hotel and Rovinj in their own way and to turn their impressions into a lasting keepsake. Upon arrival, guests are given a sort of travel diary, a Rovinj storybook and a collection of memories in one, as well as an instant camera. By saving photos and other items in the diary, this leather-bound notebook becomes their own work of art and an original reminder of their stay in Rovinj. The Bruketa&Žinić&Grey agency has designed the hotel's visual identity. The hotel’s six on-site restaurants will satisfy even the most discerning guests. Apart from Cap Aureo, the most luxurious signature restaurant, featuring spectacular views of the old town and the marina, the guests of Viva Eufemia Lobby Bar can, among other things, savour cigars and take pleasure in the largest champagne selection in Croatia. Cissa Pool Bar is a laid-back summer hang-out. Located by the pool next to the gym, it serves healthy snacks and typical summer dishes, cocktails, juices, and smoothies. In Laurel & Berry, the hotel’s main restaurant, in addition to the finest food and service, guests will be able to choose from a selection of the best local wines. Primi Terreni Restaurant & Delicatessen is a multifunctional area with an open grill, wine cellar and a wide selection of local and international delicacies (cold cuts, cheeses, drinks and the like). It includes a pop-up space designed for installations, exhibitions and shopping concepts. Lastly, Katarina's Patisserie conceived as the best cake and pastry shop in town, with an Italian-style ‘day bar’. It serves cakes, coffee and ice cream, aperitifs and cocktails, as well as light snacks such as sandwiches, salads, and pies. The Grand Park Hotel Rovinj also includes the largest and most luxurious spa&wellness centre in Istria. Àlbaro Spa&Wellness is spread across 3,800 square metres of indoor and outdoor space on two floors, including an area with three outdoor pools at the top of the hotel. It includes three saunas, two steam rooms with various temperatures and special aromatic programmes, two smaller cold pools, and a shower area for a complete thermal cycle. 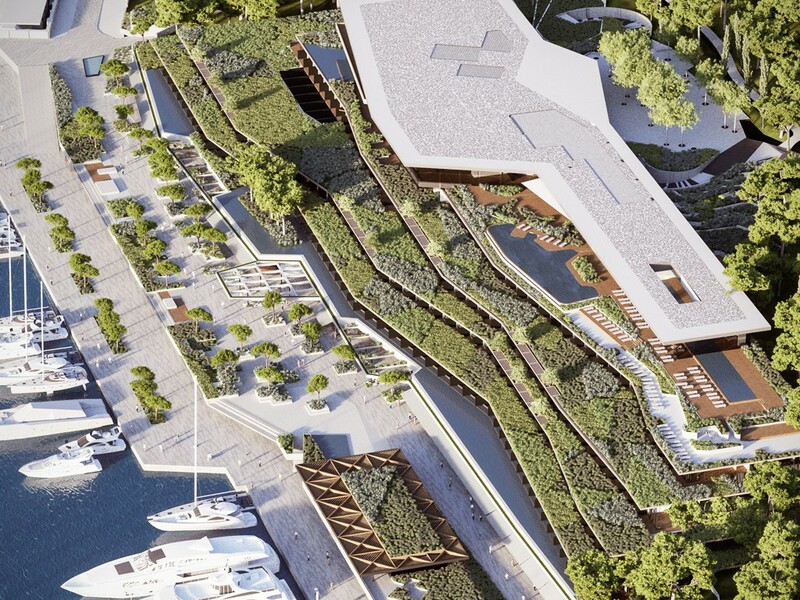 The hotel's ground floor is designed as a continuation of Rovinj's urban fabric, connecting the town centre with Lone Bay and the nearby Zlatni rt Forest Park. Rovinj residents and visitors can enjoy a walk along the Lungo Mare Plaza promenade with its inviting bars and restaurants. There are also numerous stores, including the exclusive Park Concept Store. The opening ceremony of the luxury Monte Mulini area and the new hotel will be held in late May when the Adris 44 Cup will be held under the auspices of Adris grupa. From 29 May to 2 June 2019, numerous guests will be able to enjoy one of the world's most popular sailing competitions and other complementary activities.